the time came, actually succeeded in doing so. But what Harry Hershfield, creator of Abie the Agent, accomplished a half-century earlier is no less significant. When, in 1931, Hershfield left his strip behind because King Features Syndicate wouldn't match an offer he'd received from a tiny outfit called Ace Features Syndicate, which then launched Meyer the Buyer, Hershfield's second-rate knock-off of his own work. Ace quickly folded, and Hershfield simply consigned both to the past and got on with his life. In 1935, with King unable to find another cartoonist who could pull off Abie, Hershfield returned and picked it up where he'd left off. Abie's first glimmerings began to show in Hershfield's Desperate Desmond, a farcical adventure strip he'd created as a response to Charles Kahles's Hairbreadth Harry, and Desmond's successor, Dauntless Durham. During the early 19-teens, Hershfield's hero met up with a cannibal chef named Gomgatz. The cartoonist needed an oddball, foreign-sounding speech pattern for Gomgatz, and chose one he'd grown up with — a Yiddish accent, which wasn't as familiar to newspaper readers of the time as it is to television watchers of today. Editor Arthur Brisbane, spurred by amused responses from friends, suggested Hershfield try a strip where Yiddishisms could play a prominent role on a regular basis. Thus, Abraham ("Abie") Kabibble, America's first Jewish comic strip protagonist, debuted in William Randolph Hearst's New York Journal (earlier offerings of which included The Yellow Kid and Krazy Kat) on Monday, February 2, 1914. A Sunday page was added early on. Abie wasn't an agent for a top-secret government organization, or for Hollywood stars. He was an agent, or salesman, for a car company. He hit all the Jewish stereotypes ("It ain't the principle," he once told a waiter who overcharged him, "it's the ten cents"), but in a manner that could easily be seen as the gentle kidding it was. Abie was also a warm and reasonably lovable individual, for whom readers quickly developed amused affection. His girlfriend (later wife) Reba, his friend Minsk and other supporting characters were also distinct individuals with a Jewish flair. Because of its sophisticated and sympathetic treatment of characters easily identifiable as ethnic minorities, Abie the Agent was (incorrectly but memorably) billed as the first comic strip for adults. For obvious reasons, the strip tended to be more popular in the large, ethnically diverse cities of the Northeast, than in small Midwest towns. But it still did well in national syndication, and became one of several strips the Hearst organization adapted into silent-era animated cartoons. Two of them came out in 1917 — Iska Worreh on August 5 and Abie Kabibble Outwitting His Rival on September 23. But the series wasn't continued beyond that. Also, it never got into live-action films, comic books or Big Little Books. 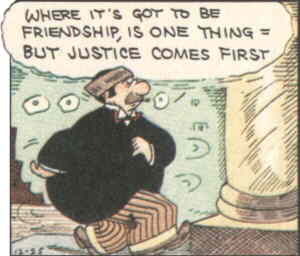 Even with its four-year hiatus (during which Hershfield used his multiple talents in radio shows, speaking engagements, animated cartoons, and other areas, as well as other comic strips) Abie the Agent remained in syndication for well over two decades — tho it did (like its once identifiably-Irish contemporary, Bringing Up Father) move with the times and gradually de-emphasize its ethnicity. It ended in 1940. In 1977, Hyperion Press brought out several volumes of comic strip reprints, such as A. Mutt, The Bungle Family and George Herriman's Baron Bean. The first year of Abie the Agent dailies was one of them. Other than that, Abie hasn't been seen much in recent decades. Text ©2003-07 Donald D. Markstein. Art © King Features.